OUR KENNELS - We currently have two kennel facilities that are climate controlled year round. One kennel houses our working dogs that are also part of our breeding program and the other kennel is our training facility kennels which house our client dogs. 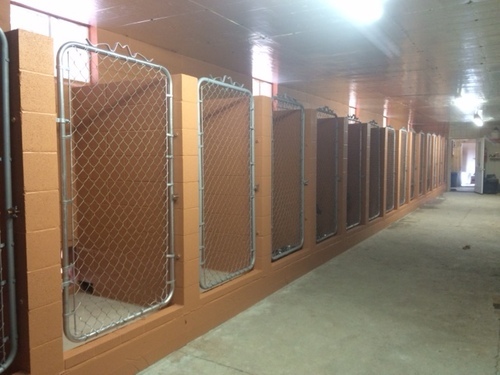 Both kennels are climate controlled in the winter and provides the same climate as you would find in any home. Most all of the dogs we work with and train are both house dogs and hunting companions and we try to maintain that same level of comfort in our kennels regardless of the time of year. OUR BREEDING PROGRAM - The dogs that make up our breeding program are all proven in the field and around the kennels to be the best of the best. We breed English Pointers, English Setters, Llewellin Setters, and Labs. All of our breeding dogs are from the best lines in the country and have passed our stringent requirements to be considered for breeding. We evaluate each breeding pair for hunting ability starting with a great nose and by hunting each dog on wild birds. We as want an intelligent dog that handles easy, retrieves and back naturally, and that trains easy and develops early. We also require a dog with solid comfirmation, style, and health before breeding is considered. We will not breed unproven dogs simply to produce pups. All dogs we use for breeding must be a proven foot hunting dog on wild birds that exhibits all the manners in the field and at home to warrant breeding. We guarantee all of our pups for health and we also provide free training for the pup if the owner participates in the training. We want you to have a healthy pup with great natural hunting ability that will train easy and will be a valued member of your family. We invite all interested parties to see our dogs in action before buying a pup. ELHEW ENGLISH POINTERS - Our English Pointers carry some of the finest Elhew breeding in the Country. Most all of our dogs are heavy linebreed Elhew Strike dogs. The current dogs in our breeding program are sons or daughters of Ch. Elhew Explorer, Elhew Sea Coral, Elhew Distinction, Elhew Politician, Elhew General Patton, Elhew Damascus and Elhew McGwire and many other Elhew dogs. Their pedigrees contain dogs such as Ch. Elhew Strike, Elhew Kiwi, Ch. Elhew Snakefoot, Elhew McGoo, Elhew Sea Wolf, Elhew Discovery, Elhew Royalty, Elhew Fibber McGee, Elhew Jefferson, Elhew Hobo, Ch. Hook's Bounty Hunter, and Ch. Guard Rail. The pups we are producing handle easily, have exceptional noses, hunt at a close to medium range and retrieve naturally. They are extremely personable and are very good around the home and with the family. It is hard to find a better breed pointer than what we are producing for both home and the field. If you look at our dogs and breeding's, you will not find a better Elhew Pointer anywhere else in the country. Unlike many other kennels, our dogs are all proven and accomplished in the field on wild birds and over three years of age prior to breeding. ENGLISH SETTERS - Our English Setters carry some of the finest Smith Setters blood that you can find. Our dogs are direct decendants of dogs such as Ch. Destinare, Ch. Performer, Ch Tomoka, and Ch. Stillmeadow Jim. We also have dogs that are sired by Pennstar and other exceptional coverdogs. Generally our pups are close working and very easy handling. They have exceptional noses, style, and are some of the best natural bird dogs we have. If you are looking for a close working, quick to develop setter with big style, exceptional personality, and great natural talent, then we have the type of setter for you. ALL OF OUR PUPS ARE GUARANTEED FOR HEALTH AND PERFORMANCE. FREE TRAINING ASSISTANCE IS PROVIDED WITH EACH OF OUR PUPS. PLEASE DON'T HESITATE TO ASK ABOUT DETAILS REGARDING THE HEALTH GUARANTEE AND FREE TRAINING ASSISTANCE WHEN CONSIDERING A PUP.